Where do I use my Green People voucher code? Shop by product to find skin care, body care, hair care, sun care, makeup, toothpaste, gifts, organic travel items, samples and even new in products. You can also shop by collection to find products that are scent-free and age-defying as well as products specifically for babies, children, men and teenagers. If you’re shopping because of a beauty concern you have, you can discover categories full of products dedicated to various facial skin types, the body, various hair types, anti-ageing, sun, teeth, men, babies and pregnancy. Green People also have a fantastic offers section where there are loads of deals and savings available. Find products on offer with up to 50% off as well as more limited-time only discount codes and sales that allow you to save up to £25 on your order. The offers section is updated regularly, so make sure you check back as much as you can to find new ways to save money on your skin care. Green People provide an extremely handy ‘Beauty hub’ where you can find a great blog section as well as ‘an ask Charlotte’ section; an area where you can put any of your beauty concerns or queries forward to the founder of Green People: Charlotte Vohtz. In the blog section, there are tons of categories you can browse through to discover advice on all manner of things including skin, babies and children as well as skin allergies and sensitivity, healthy living, exercise, ingredients, and eco/ethical products. There’s also loads of information on skin, make-up, hair, anti-ageing and much more available too. If you love makeup but aren’t keen on the way it’s produced, ditch your big name brands for a more ethical and natural company that don’t test on animals and use no harmful substances in any of their beauty products. The naturally made makeup at Green People is all free of parabens, petrochemicals, talc, alcohol, carmine and other artificial, pore-clogging ingredients which makes it perfect for sensitive skin and skin prone to acne, eczema or psoriasis. Shop for all kinds of makeup including mineral powder, foundation, concealer, mascara, eyeshadow, blusher, lipstick and lip care all of which has been inspired by the hues of nature. All the makeup available provides pure coverage that lasts all day long, natural mineral pigments for lasting colour and a broad spectrum of colours available in SPF 15. Green People is the UK’s most loved natural and organic skin care brand, ideal for people suffering with skin disorders and allergies as well as those of you who prefer to use beauty products that you can be assured come from an ethical background, absent of any chemicals or harmful substances too. 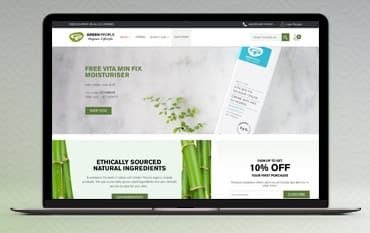 Shop online at Green People and discover a whole host of skincare products for your face, body, teeth and even your baby, use a discount code from us at the checkout and you can enjoy incredible savings on your order too.